DOTmed.com - Is medical 3D printing destined to become as commonplace as X-ray? Hand mit ringen (Hand with rings). More than 100 years ago, Mrs. Anna Roentgen saw the world’s first X-ray – taken of her left hand – and the shock of seeing the skeletal outline of her own fingers made her declare “I have seen my death”. The famous image was created by her husband, Sir Wilhelm Conrad Roentgen, a German mechanical engineer and physicist. Of note, Sir Wilhelm was not focused on advancing medicine when he discovered that X-rays could see within the body. The image was just one of a series, largely consisting of inanimate objects, and there was nothing wrong with Mrs. Roentgen’s hand. However, that image captured the imagination of healthcare providers, and it’s no secret the technology has revolutionized medicine, with an estimated 3.6 billion diagnostic X-rays performed annually. 3D printing is another non-medical innovation which has captured the imagination of healthcare, and although the novel opportunity to hold your own internal organs in your hands might elicit squeamish feelings like Mrs. Roentgen’s, years from now medical 3D printing may be as commonplace as an X-ray. 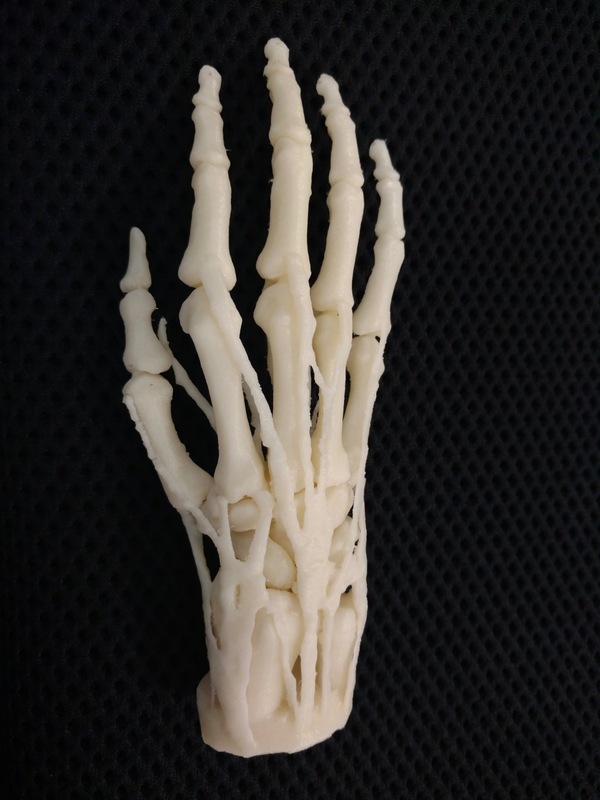 3D-printed model of a hand and wrist, along with tendons. 3D printing was invented in the 1980’s by engineer Chuck Hull. Like Roengten, Chuck Hull’s wife was the first person to see the product of his invention – he called her out of bed in the middle of the night to come down to the lab in her pajamas, and she told him “this had better be good”. It is safe to say it was good – good enough to fuel a manufacturing technology estimated to exceed $20 billion in 2020 and impact fields as diverse as architecture, aeronautics, and medicine. Medical 3D printing is still very much in its infancy; approximately 100 hospitals in the U.S. have in-house 3D printing capabilities today, up from three in 2010, (according to an SME 2018 Medical Additive Manufacturing / 3D Printing report). Following this trend, the Department of Veterans Health Affairs has seen growth in 3D printing hospitals from three to 20 over the past three years. The enthusiasm for the technology and its adoption is expected to continue to grow at a rapid pace, and new medical applications are likely being imagined weekly. These include use of physically accurate models of a patient’s anatomy for pre-surgical planning, creation of bespoke implants, design of custom surgical tools and cutting guides, and custom orthotics and prosthetics, to name only a few.